Did An Alien Spacecraft Just Fly By Earth? Recently something incredible entered our solar system, and it’s been baffling scientists ever since. The object is traveling at 60,000 m.p.h. and may have been around for hundreds of millions of years. But what’s really puzzling is that it doesn’t look like anything we’ve ever seen before in our solar system. Could this be the first real sign of alien life? But what’s really intrigued scientists is that the object is 400 meters long and only 40 meters wide. This makes it the most elongated asteroid ever discovered. What’s more, it also seems to be traveling on an unusual path. It’s not getting sucked in by our sun’s gravity. Instead, it seems to be moving on a path that will eventually take it out the other side of the solar system. Could this possibly be an alien craft? The odd shape could be linked to its extended course from another solar system. Or, how it actually broke away from a star during the formation of its solar system. But, there’s another possibility… one that’s far more intriguing. Maybe, Oumuamua is elongated because it’s artificially made. 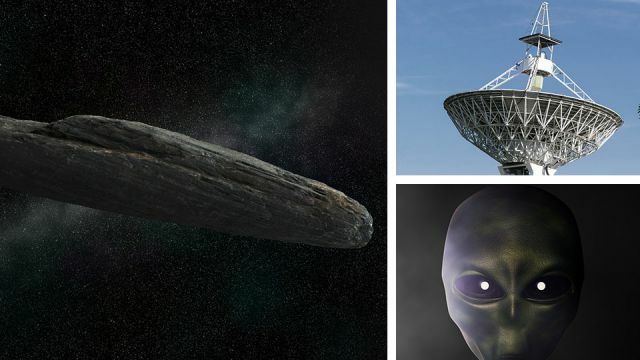 What if it’s an artifact from an advanced alien civilization or even an alien craft? While it’s likely a natural object, there’s also a possibility that it isn’t. And it’s for this reason that the object has caught the attention of astronomers with the Breakthrough Listen project. First launched in 2015, Breakthrough Listen is a global astronomical initiative created by investor and philanthropist Yuri Milner and cosmologist Stephen Hawking. Today, however, the board consists of Stephen Hawking, Yuri Milner, founder of DST Global and Mark Zuckerberg, founder and CEO of Facebook. Breakthrough Listen is actively looking for evidence of technological life in the universe. It aims to survey one million nearby stars, the entire galactic plane and 100 nearby galaxies. Today, December 13, 2017, at 3 p.m. EST, Breakthrough Listen will point the largest fully-steerable radio telescope in the world at Oumuamua. The 100-meter Green Bank Telescope will scan the object for ten hours, hoping to discover if it is, in fact, an alien artifact. All the while listening to four radio bands, from 1 to 12 GHz, to see if any transmissions are being emitted. If the object has a transmitter as powerful as a cell phone, it will take less than a minute for the telescope to detect any sounds, according to Breakthrough Listen reps. That means we should know within a few days whether it’s a natural phenomenon or of alien origin. Currently, Oumuamua is just two astronomical units away, or twice the distance between the Earth and Sun. That means it’s closer to us than the most distant human artifact, the Voyager I spacecraft. Just this past August, Breakthrough Listen, in an initiative to find signs of intelligent life in the universe, detected 15 fast radio bursts emanating from the mysterious “repeater” FRB 121102. Fast radio bursts or FRBs, are brief, bright pulses of radio emission from distant galaxies. These intense blasts of radio waves last only one to five milliseconds. And astronomers find this is puzzling. Leading theories suggest that FRBs come from incredibly volatile cosmic events. For instance, FRBs could come from the material being ejected from supermassive black holes or supernovae explosions. Or, they could come from rotating magnetars that hit surrounding material with their massive magnetic fields. But researchers at the Harvard-Smithsonian Center for Astrophysics (CFA) propose a more intriguing theory. What if FRBs aren’t natural phenomena at all? What if they come from a massive artificial structure used to power alien spacecraft? Research published in Astrophysical Journal Letters by Avi Loeb, a professor at CFA, and his co-author Manasvi Lingam, from Harvard University, evaluated the feasibility of creating a radio transmitter strong enough to be detectable across massive distances. They found that, if the transmitter were solar powered, then sunlight falling on an area of a planet twice the size of the Earth could generate enough energy. It was Loeb — who’s written numerous papers on the search for extraterrestrial life — who first brought the idea to Breakthrough Listen backer Yuri Milner. He suggested that the mysterious object might be artificial. While such an enormous feat is well beyond human technology, it is still within the realm of possibility, according to the laws of physics, say CFA. How will we know if Oumuamua is an alien spacecraft? Obviously, the first giveaway would be the radio transmissions heard across a range of wavelengths. “Narrow radio emissions, especially if they are modulated in some way, don’t really happen in nature,” suggests Olivier Hainaut, an astronomer at the European Southern Observatory, to Cosmos Magazine. Astronomers can also gain valuable insight from the surface properties of the object. By analyzing the spectrum of reflected light they could find that the dark red hue on Oumuamua indicates spacecraft paint. In addition, seeing bright, short flashes could also suggest an artificially polished surface. Moreover, an object that’s rotating might suggest it’s creating artificial gravity. An alien spacecraft might also give off a heat source from an engine or an internal energy source, visible to us in the thermal infrared. For that matter, an alien engine might also give off detectable emissions. And, of course, if the object strays off the path of a natural gravitationally-driven orbit, this might suggest it’s being engine driven. Okay, so it could just turn out to be a lump of metal-rich rock moving through our solar system. Even so, this object presents a great opportunity for scientists. Think of this as a sort of a practice run to test our abilities for finding aliens — when they do eventually arrive. On the other hand, we could be on the brink of discovering something phenomenal: that alien life does exist! I’m hoping for the latter. What about you? Previous articleDo You Have These 5 Traits To Live A Long And Healthy Life? Hey Buddy!, I found this information for you: "Did An Alien Spacecraft Just Fly By Earth?". Here is the website link: https://www.thealternativedaily.com/did-an-alien-spacecraft-fly-by-earth/. Thank you.